my buying experience is good. although there are few things that i am not so saitisfied with this ring. first is that on the ring there is only a sign "pd" showing that it is palladium. i called customer service and the answer is that the palladium is 95% but they do not put number on the ring (as i know, usually it should be shown as "pd950"). second, the ring looks very beautiful, however, the design is not very good. the side of the ring gave me couple of scraches and left a scar on my finger. This sparkling palladium engagement ring has a lovely engraved wheat pattern on three sides. 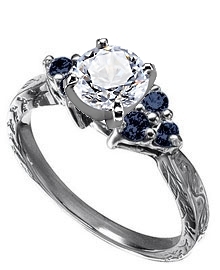 There are three 2.5 mm round blue sapphires on either side of the center setting for a total of six sapphires. You choose the center diamond from Danforth's inventory.